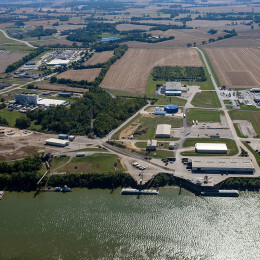 The Henderson County Riverport’s general cargo handling area includes a cargo dock with 42,000 sq. 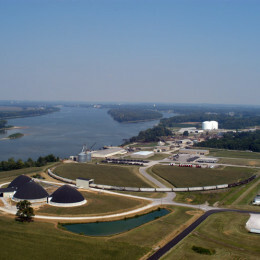 ft. of open dock space and a 125-ton electric-pedestal crane capable of handling commodities from barge, truck, or rail. Our terminal is noted for its crane capacity and design configuration, which provides excellent heavy-lift capacity. The primary dock area includes adjacent warehouses and outside yards for storage of numerous commodities. 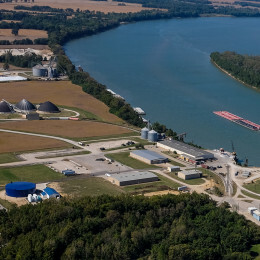 A second dock immediately upstream is used for grain transfer to outbound barges using a high capacity grain conveyor and inbound liquid nitrogen via pipeline. 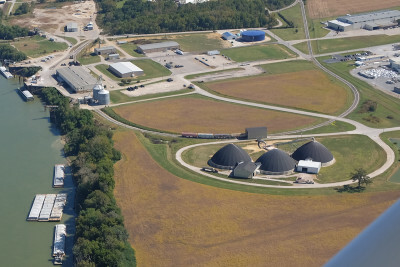 The dry bulk fertilizer distribution facility includes three 135-foot diameter storage domes, conveyors, rail dump pit, operating areas, and access roads for connection the general cargo dock. 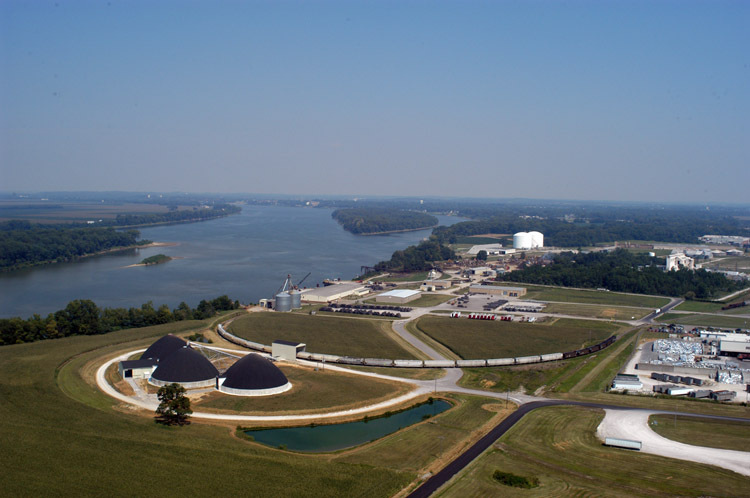 The total storage capacity for this facility is 33,000 tons. 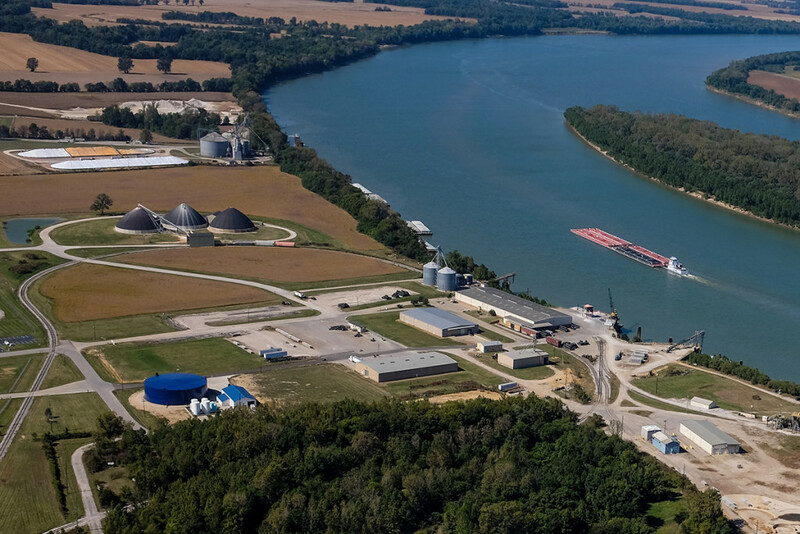 In addition, the Henderson County Riverport has leased a site which receives and ships liquid fertilizer. Full service staffing with inside and outside warehouse space available to position your products nearby your customer base. The port retains 50,000 square feet of inside warehousing just for the customers who need inside storage without the hassles of leasing and staffing. Three other warehouses are available for lease should clients have longer term needs. Experienced staff, including equipment operators and clerical support, are offered to our customers for a complete turnkey solution. 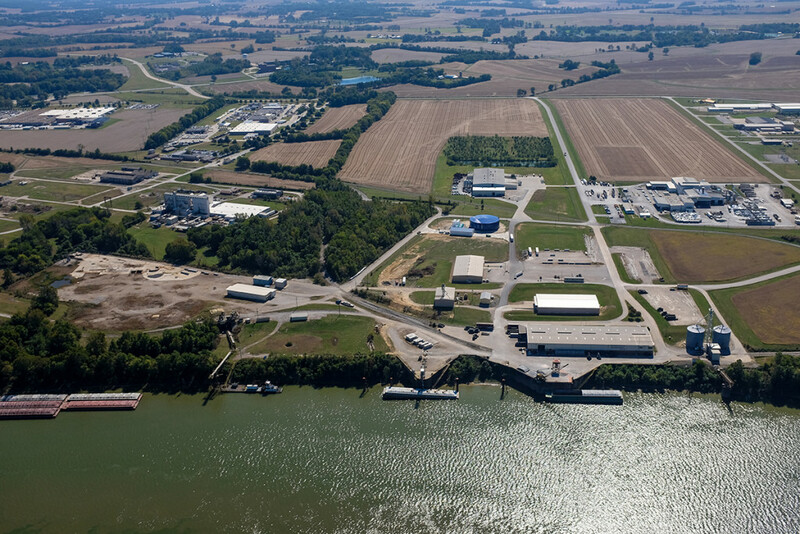 For incoming and outgoing company executives, the Henderson City-County Airport is within sight of the Henderson County Riverport and is fully capable of handling executive and private aircraft, including light commercial craft and jet service. 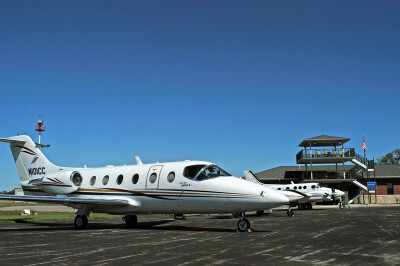 With a 5,504-foot paved, lighted runway, the Henderson City-County Airport has a fixed based operation offering ample hangar space, national air taxi-freight service, and is a Bell Helicopter Service facility.